Nadafan, M., Malekfar, R., Dehghani, Z. (2015). Investigation in to Properties of Polyurethane Closed Cell by High Loading of SiO2 Nanoparticles. International Journal of Nanoscience and Nanotechnology, 11(3), 185-192. M. Nadafan; R. Malekfar; Z. Dehghani. "Investigation in to Properties of Polyurethane Closed Cell by High Loading of SiO2 Nanoparticles". International Journal of Nanoscience and Nanotechnology, 11, 3, 2015, 185-192. Nadafan, M., Malekfar, R., Dehghani, Z. (2015). 'Investigation in to Properties of Polyurethane Closed Cell by High Loading of SiO2 Nanoparticles', International Journal of Nanoscience and Nanotechnology, 11(3), pp. 185-192. Nadafan, M., Malekfar, R., Dehghani, Z. Investigation in to Properties of Polyurethane Closed Cell by High Loading of SiO2 Nanoparticles. 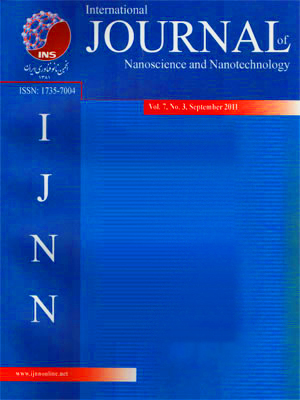 International Journal of Nanoscience and Nanotechnology, 2015; 11(3): 185-192. 1Department of Physics, Tarbiat Modares University, Tehran, I. R. Iran. In this research the composition of polyurethane closed cell (PUCC) with two different concentrations of SiO2 nanoparticles (1.0 and 2.0 wt%) have been prepared. Optical microscopy and SEM imaging, watering uptake, FTIR and Raman spectroscopy of the synthesized samples were carried out. The optical microscopy imaging of samples showed differences in the appearance of matrix produced by applying different concentrations of SiO2 nanoparticles (NPs). The mean cell size of the foams decreased with the addition of SiO2 NPs from 0.0 wt% up to 2.0wt%.Variation in the water uptake of specimens is related to the function of SiO2NPs concentrations. The degree of phase separation and the hydrogen bonding index in samples were evaluated in terms of their FTIR spectroscopy data. The apparent and real densities of foams were measured and then total, open and closed porosity of samples were calculated. With elevating the amount of nanoparticles the open porosity of samples almost increased, while the closed and total porosity decreased. The Raman spectra of the synthesized samples were used for evaluating possible interaction between SiO2 NPs and PUCC foams.